In May, judges poured over more than 200 entries sent by design teams from 48 countries, pitching ways to revitalize and reimagine city-owned lots and alleyways between the downtown City Creek shopping center and the performing-arts district. 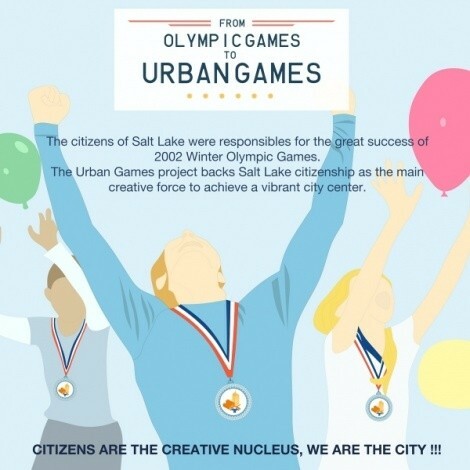 The competition pushed by the Utah Young Architects Forum and supported by local donors created the competition to award winning entries and also provide city planners ideas on how to give some of the city’s neglected streets, alleys, and vacant lots an artsy-extreme makeover. Two jury-award winners and a “People’s Choice Winner” will receive $40,000 each in prize money. The “People’s Choice Winner” announced Tuesday was "Olympic Games to Urban Games," submitted by Madrid-based PKMN Architectures. The design (pictured) celebrates the city’s hosting of the 2002 Winter Olympic Games by calling for the placement of interactive games downtown that passersby can play and have their high scores displayed for all to see. F FINALIST VIDEO from Third Sun Productions on Vimeo. Jury-award winners include “Inner Circuit,” a design by Philadelphia-based Square One Studio calling for integrating public art venues in unlikely places, like a possible stage for performances along Regent Street or using a building wall to screen movies for the public to watch. D FINALIST VIDEO from Third Sun Productions on Vimeo. Salt Lake City-based Urban Arts Lab also got a jury award for a plan calling for unique art installations, some utilizing affordable shipping containers for hosting rotating art exhibits. For more on the winners, visit the SixtyNine Seventy site here.